NOTES: This popular loop hike located in Urbana State Forest has interpretive nature guide books to help hikers enjoy this trail. This hike starts at the "FLT Parking Area" located on Bean Station Road just 200 feet from where the Bristol Hills Trail crosses the road. 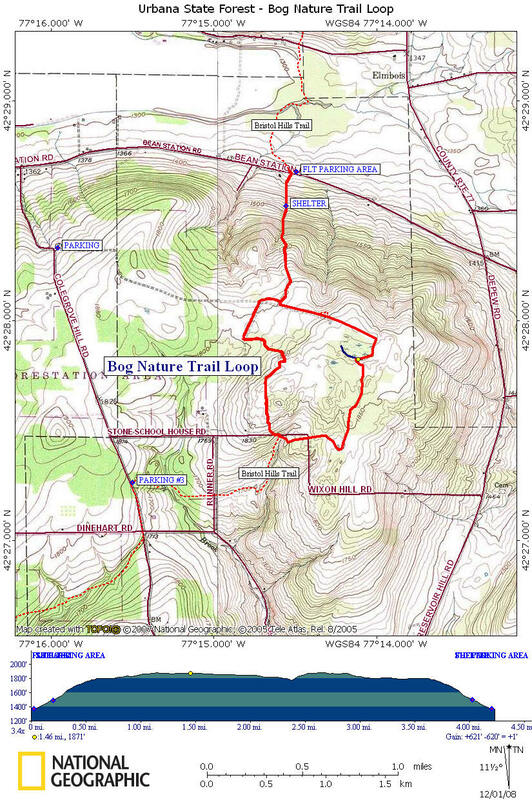 This loop hike is a total of 4.3 miles long. Below there is a map and description of this hike. There is an elevation change of 620 feet for this hike. HIGHLIGHTS: The large Evangeline Shelter with its loft, fireplace and camping area. The restored Covell Cemetery, Huckleberry Bog and Bog Observation Deck. Interpretive Nature Guide Books are available at the register box at the junction of the Bog Nature Trail and Bristol Hills Trail. Directions: From the south end of Canandaigua Lake take NY 53 south. Just south of Prattsburg, turn left on Bean Station Road. Pass Dineharts Crossing Rd & Colegrove Hill Rd. Look for the "FLT" signs on both sides of the road. The parking area is just east of the trail crossing. N 42 28.660 - W 77 14.428 for your gps unit. From Bean Station Road, follow the orange blazed Bristol Hills Trail south. Trail register. Pass Bog Nature Trail (blue blazes) on right, then turn left on old grassy lane. Still on Bristol Hills Trail and following orange blazes. Turn right off old grassy lane. Bog observation deck and 0.1 mile blue spur trail. Cross abandoned section of Wixom Road. Cross stream, then trail register. Reach junction with Bog Nature Trail (blue blazes) on right. Turn right and follow blue blazes. Nature Trail turns right onto old road. Turn right on old road, still following blue blazes. Trail register. Reach Bristol Hills Trail junction. Turn left and follow orange blazes downhill. Bean Station Road and the end of this loop hike.